Several works by the husband-and-wife team of Iona and Peter Opie are listed additionally and/or separately on LT under their individual names. Max & Ruby are like peanutbutter & jelly - we just can't get enough! Delight in their newest interactive escapade in Max & Ruby's Treasure Hunt. In Following Grandfather, Wells explores the grief of a young mouse upon the passing of her beloved Grandfather. Born in in New York City, Rosemary Wells grew up in a house filledwith "books, dogs, and nineteenth-century music." After a brief tenure at the Museum School in Boston, she married and began a career as a book designer, then published her own first picture book in 1968. From the start, Rosemary Wells’s work has been recognized for its strong sense of humor and realism and its gently rebellious approach to childhood. Her books have received numerous honors, including a New York Times Book Review Best Illustrated Book of the Year and a Publisher's Weekly Best Book of the Year award for MY VERY FIRST MOTHER GOOSE. 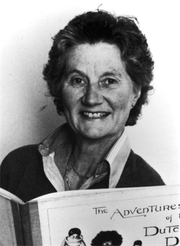 Iona Opie is currently considered a "single author." If one or more works are by a distinct, homonymous authors, go ahead and split the author. Iona Opie is composed of 14 names. You can examine and separate out names.